https://sep.yimg.com/ay/yhst-33477391359232/torch-coral-euphyllia-glabrescens-trumpet-coral-grape-coral-pom-pom-coral-whisker-coral-9.jpgTorch Coral - Euphyllia glabrescens - Trumpet Coral - Grape Coral - Pom-Pom Coral - Whisker CoralModerateAggressiveYesCalcium, Strontium, Trace elementsIndo-PacifcCaryophylliidaeSmall 2" - 3"
Torch Coral - Euphyllia glabrescens Taxonomy: Torch Coral belongs to Kingdom Animalia, Phylum Cnidaria, Class Anthozoa, Family Caryophylliidae, Genus Euphyllia and Species glabrescens. Scientific names: The scientific name of Torch Coral is Euphyllia glabrescens. Other common names: Torch Coral is also commonly known as Pom-Pom Coral, Trumpet Coral, Grape Coral, Whisker Coral, Branching Anchor Coral and Branching Hammer Coral. Coral Type: Torch Coral is a Large Polyp Stony (LPS) Coral. Origin or natural range: Euphyllia glabrescens originates from the Indo-Pacific region including Fiji, Tonga, Solomon Islands and the Great Barrier Reef. Color: Torch Coral occurs in green, brown, pink, golden, yellow and tan colors. Compatibility: Euphyllia glabrescens is aggressive towards the other marine aquarium invertebrates. Torch Coral is moderately hardy. Euphyllia glabrescens has branched skeletal base which is covered by polyps. The polyps of Torch Coral are long and have single rounded tip. The long polyps of Euphyllia glabrescens wave with the water currents. Torch Coral has sweeper tentacles tipped by the stinging cells, nematocysts. Torch Coral extends its sweeper tentacles at night. Torch Coral needs indirect, moderate water current in the marine aquarium it inhabits. Exposing Euphyllia glabrescens to direct, strong water current may hamper its complete spread. If the polyps of Torch Coral do not open up fully then you need to check the quality of water in your marine aquarium. Keep the water in your marine aquarium clean so that it is free of any infectious organism. Torch Coral requires moderate to high intensity indirect lighting in the marine aquarium it inhabits. Actinic lighting and / or high output fluorescent lighting such as VHO and Power Compact are recommended for Euphyllia glabrescens. Torch Coral may take some time in adjusing to Metal Halide lighting. The coloration of Euphyllia glabrescens may be determined by the intensity of light the coral is exposed to. Torch Coral should be kept in an aquarium with a capacity of fifty gallons and above. Place Euphyllia glabrescens on some substrate at the bottom of your marine aquarium. Keep Torch Coral away from the other marine aquarium invertebrates as the coral may sting them upon contact. Euphyllia glabrescens derives its nutrition mainly through photosynthesis which is performed by zooxanthellae, a photosynthetic alga living symbiotically within the coral. Torch Coral is Carnivorous in feeding habit and filter feeds weekly, when open. Euphyllia glabrescens feeds upon acellular marine invertebrates, frozen meaty bits of raw shrimp, Silver Side, fish, squid and Mysis Shrimp, zooplankton and phytoplankton. Add Calcium, Strontium and trace elements to the water as dietary supplements for Torch Coral. 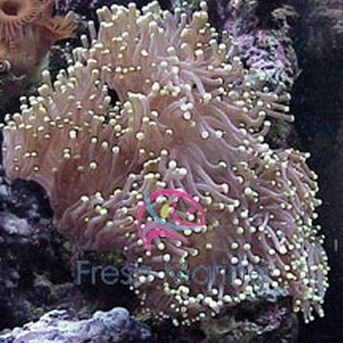 Euphyllia glabrescens grows easily and rapidly in a marine aquarium meeting the coral�s all the environmental requirements. Torch Coral breeds asexually through fragmenting. Each resulting piece grows to an individual Torch Coral. Torch Coral requires moderate care. Euphyllia glabrescens is susceptible to Brown Jelly Infection in which the parasite converts the coral into a jelly like substance and thus kills it. Clownfish may also live upon Euphyllia glabrescens in the absence of a suitable anemone host. Torch Coral has long sweeper tentacles that can sting any other marine aquarium invertebrate that touches them. Therefore, keep the other tank members at a safe distance from the Torch Coral. Torch Coral may also sting you, therefore, handle the coral carefully.